A 60-year-old female with rheumatoid arthritis presents with unilateral eye pain and redness without reported vision changes. Physical examination demonstrates radially-oriented engorged episcleral vessels and normal visual acuity – she was diagnosed with episcleritis and discharged with follow-up. The red or painful eye is a common presentation in the emergency department and the rapid identification and management of potentially sight-threatening causes is critical. The diagnostic approach to the red or painful eye begins with identifying a history of caustic exposure where immediate and copious irrigation (even before detailed examination) may limit further injury. Alkaline agents induce more severe liquefactive necrosis leading to keratoconjunctivitis, while acidic agents are generally less destructive. Management is identical for both: irrigation with lactated Ringer solution through a Morgan lens applied to a topically anesthetized eye for 5-10 minutes repeated until the pH of the eye is neutral1. Ocular or facial trauma presents a spectrum of differential diagnoses. Suspicion for globe rupture is increased by a suggestive mechanism such as a high-velocity projectile or high-impact blunt facial trauma. Characteristic examination findings include obvious globe deformity, an irregularly-shaped pupil, extrusion of vitreous, markedly decreased visual acuity, or parting of fluorescein (Seidel sign). If globe rupture is suspected, further manipulation is unadvisable and the affected eye should be shielded. Measures should be taken to avoid increases in intra-ocular pressure including elevation of the patient’s head-of-bed, anti-emetics (to prevent intra-ocular hypertension with vomiting), and the avoidance of medications potentially implicated in intra-ocular hypertension (ketamine, succinylcholine). Tetanus and antimicrobial prophylaxis should be provided while awaiting emergent ophthalmology consultation2,3. Another traumatic diagnosis warranting rapid identification and possible intervention is retrobulbar hematoma – identified by proptosis, eye pain, decreased visual acuity, and elevated intra-ocular pressure. Pressures exceeding 40mmHg warrant lateral cantholysis in conjunction with medical management to prevent optic nerve ischemia and preserve vision4,5. The examination begins externally with an assessment of function (visual acuity) and inspection and palpation of the periorbital region. Periorbital edema, erythema, and tenderness to palpation in the setting of systemic illness (fever) is concerning for orbital cellulitis. When associated with elevated intra-ocular pressure or proptosis, a retrobulbar abscess may be present. Both warrant admission and parenteral antibiotics and the latter may require operative management such as aspiration or cantholysis. Less severe features without impact on visual acuity is suggestive of a periorbital cellulitis which may be treated as an outpatient with close follow-up2,6. Several non-emergent processes may affect the lids and lashes including blepharitis (inflammation of the eyelid margin), chalazion (inflammation of the Meibomian glands), hordeolum (eyelash follicle abscess), or dacrocystitis (infection of the lacrimal sac)2,7,8. Again, proceeding from superficial to deeper structures we encounter the epithelial layer (including palpebral and bulbar components) covering the sclera which is subject to allergic or infectious inflammation. Conjunctivitis is characterized by engorgement of superficial conjunctival blood vessels, potentially associated with conjunctival edema (chemosis), or discharge. Most conjunctivitis is self-limited and not sight-threatening, treatment is aimed at symptomatic relief though topical antibiotics have few adverse effects and may be prescribed if the diagnosis of bacterial conjunctivitis is unclear9. When associated with pain, a deeper inflammatory process is implicated. Scleritis is a frequently immune-mediated inflammatory process (though infection, malignancy and medications have been implicated) associated with pain, photophobia, and examination findings of globe tenderness and engorged scleral blood vessels. 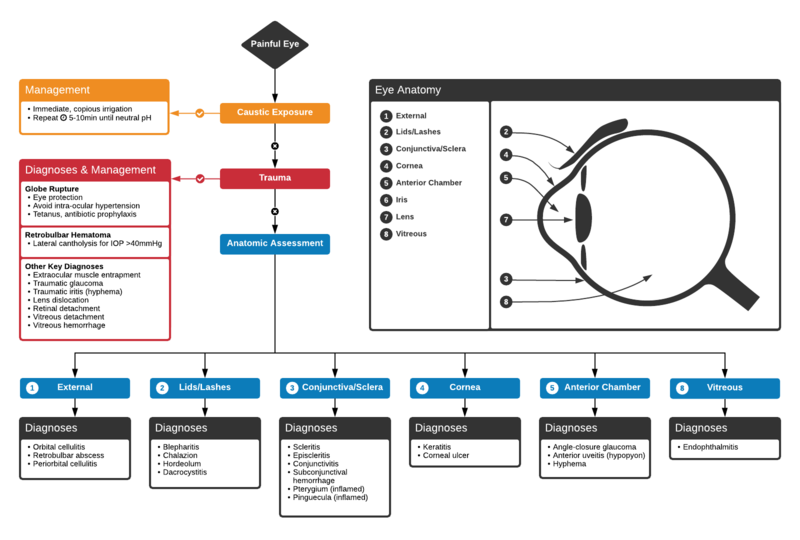 Management in the emergency department is trivial (systemic NSAID’s), however ophthalmology consultation should be secured due to the risk of vision-compromising complications, as well as the intimation of an underlying systemic disorder9,10. Episcleritis is similarly immune-mediated, though generally self-limiting. The diagnosis is made by identification of characteristic, radially-oriented engorged episcleral vessels. When the diagnosis of scleritis versus episcleritis or conjunctivitis is in question the application of a topical vasoconstrictor (phenylephrine 2.5%) will blanch vessels in the conjunctival or superficial episcleral plexuses – sparing scleral vessels10,11. Keratitis can be caused by infection, ultraviolet light exposure, or contact lens use. Patients may have photophobia and a foreign-body sensation. Gross inspection or slit-lamp examination will show epithelial erosions that stain with fluorescein or the characteristic dendritic pattern accompanying herpes simplex virus infection. Management includes ophthalmology consultation, topical antibiotics if a bacterial process is suggested, and close follow-up7-9,12. A critical process occurring in the anterior chamber is angle-closure glaucoma. The patient commonly presents with severe pain, circumcorneal injection, and a pupil fixed at mid-dilation. Diagnosis is confirmed by the measurement of elevated intra-ocular pressure (greater than 20mmHg). Reduction of intra-ocular pressure with topical and systemic agents should begin immediately while awaiting emergent ophthalmology consultation13. The slit-lamp microscope facilitates examination of the anterior chamber. The presence of cells (floating white and red blood cells, or layering hypopyon or hyphema) and flare (protein) suggest inflammation in the anterior segment caused by a systemic inflammatory process, infection, or trauma and warrants close ophthalmologic follow-up2,7,9. An ocular examination mimicking orbital cellulitis with evidence of anterior chamber involvement, particularly in a patient with a history of recent ocular surgery or trauma suggests endophthalmitis. Management requires admission for parenteral antibiotics with ophthalmology consultation2. Advanced imaging may be useful in the diagnosis of traumatic and non-traumatic orbital pathology. Multi-detector computed tomography (MD-CT) is readily available and rapidly performed in the emergency department and can aid in the diagnosis of critical infectious processes, including extension beyond the orbital septum in orbital cellulitis, scleral thickening in endophthalmitis, and characterization of hematoma or abscess in the retrobulbar space. The addition of intravenous contrast media can identify critical vascular processes such as cavernous sinus thrombosis14,15. For traumatic pathology, CT can assist with the evaluation of globe integrity, lens position, vitreous/retinal detachment, and foreign bodies16. Imaging cannot be relied upon exclusively to exclude pathology, and the patient’s presentation and clinician’s examination should determine the need for consultation and evaluation. For globe rupture, for example, in one study of 59 patients with severe ocular trauma and diagnostic uncertainty regarding the presence of globe rupture, CT failed to diagnosed open globe injury in 1/3 of patients (with surgical scleral inspection as a reference standard)17. Another retrospective analysis of 48 eyes sustaining trauma revealed sensitivity ranging from 56-68% for CT identification of open globe injury18. In addition to potential diagnostic inaccuracy, computed tomography exposes patients to risks including ionizing radiation, and the possibility of contrast-induced nephropathy19. Ultrasound is becoming increasingly accessible and comfortable for the emergency physician, and has the benefit of being relatively non-invasive – including facilitating ocular examination in patients with significant periorbital swelling limiting eye-opening. Ocular ultrasound may aid with the diagnosis of a wide variety of ocular pathology including vitreous hemorrhage, retinal detachment, central retinal arterial/venous occlusions, foreign body identification, lens dislocation and retrobulbar hematoma. In one study of 61 patients presenting with trauma or acute vision changes, ultrasound interpretation agreed with criterion standard (orbital computed tomography or ophthalmology evaluation) for 98% of cases20. Messman AM. Ocular Injuries: New Strategies In Emergency Department Management. Emergency Medicine Practice. 2015;17(11):1–21–quiz21–2. Wright JL, Wightman JM. Red and painful eye. … Concepts and Clinical Practice 8th ed …. 2014. Romaniuk VM. Ocular trauma and other catastrophes. Emerg Med Clin North Am. 2013;31(2):399-411. doi:10.1016/j.emc.2013.02.003. Babineau MR, Sanchez LD. Ophthalmologic Procedures in the Emergency Department. Emerg Med Clin North Am. 2008;26(1):17-34. doi:10.1016/j.emc.2007.11.003. Rowh AD, Ufberg JW, Chan TC, Vilke GM, Harrigan RA. Lateral canthotomy and cantholysis: emergency management of orbital compartment syndrome. J Emerg Med. 2015;48(3):325-330. doi:10.1016/j.jemermed.2014.11.002. Henderson M, Tierney L, Smetana G. The Patient History: Evidence-Based Approach. McGraw Hill Professional; 2012. Alteveer JG, Mccans KM, Hemphill RR. The Red Eye, The Swollen Eye, And Acute Vision Loss. … Practice+ Em Practice …. 2002. Leibowitz HM. The red eye. N Engl J Med. 2000;343(5):345-351. doi:10.1056/NEJM200008033430507. Mahmood AR, Narang AT. Diagnosis and management of the acute red eye. Emerg Med Clin North Am. 2008. doi:10.1016/j.emc.2007.10.002. Albini TA, Rao NA, Smith RE. The Diagnosis and Management of Anterior Scleritis. International Ophthalmology Clinics. 2005;45(2):191. Roscoe M, Landis T. How to diagnose the acute red eye with confidence. JAAPA. 2006;19(3):24–30–quiz45–6. Deborah S Jacobs MD. Evaluation of the red eye. UpToDate. https://www.uptodate.com/contents/evaluation-of-the-red-eye. Published February 24, 2016. Accessed April 18, 2017. Prum BE, Herndon LW, Moroi SE, et al. Primary Angle Closure Preferred Practice Pattern(®) Guidelines. Ophthalmology. 2016;123(1):P1-P40. doi:10.1016/j.ophtha.2015.10.049. LeBedis CA, Sakai O. Nontraumatic orbital conditions: diagnosis with CT and MR imaging in the emergent setting. Radiographics. 2008;28(6):1741-1753. doi:10.1148/rg.286085515. Platnick J, Crum AV, Soohoo S, Cedeño PA, Johnson MH. The globe: infection, inflammation, and systemic disease. YSULT. 2011;32(1):38-50. doi:10.1053/j.sult.2010.12.003. Dunkin JM, Crum AV, Swanger RS, Bokhari SAJ. Globe trauma. YSULT. 2011;32(1):51-56. doi:10.1053/j.sult.2010.09.003. Hoffstetter P, Schreyer AG, Schreyer CI, et al. Multidetector CT (MD-CT) in the diagnosis of uncertain open globe injuries. Rofo. 2010;182(2):151-154. doi:10.1055/s-0028-1109659. Arey ML, Mootha VV, Whittemore AR, Chason DP, Blomquist PH. Computed tomography in the diagnosis of occult open-globe injuries. Ophthalmology. 2007;114(8):1448-1452. doi:10.1016/j.ophtha.2006.10.051. Custer PL, Kent TL. Pitfalls of ophthalmic radiographic imaging. Curr Opin Ophthalmol. 2014;25(5):432-435. doi:10.1097/ICU.0000000000000064. Blaivas M, Theodoro D, Sierzenski PR. A study of bedside ocular ultrasonography in the emergency department. Academic Emergency Medicine. 2002;9(8):791-799.